JOHN 5 AND THE CREATURES, featuring ROB ZOMBIE guitarist John 5, have added six more dates to the itinerary of their US Tour in support of the new album, Season Of The Witch. Stops in Phoenix, Charlotte, Greensboro, Wilmington, Virginia Beach and Richmond have been added. 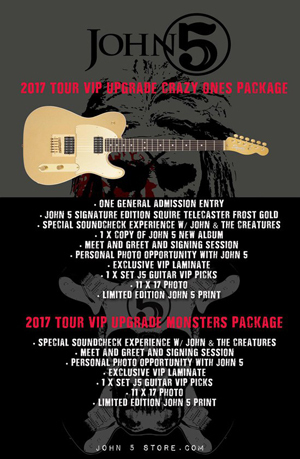 Special VIP packages have been created for the tour and you can check them out right HERE. John 5 will release his eighth full-length solo album, entitled Season Of The Witch, on March 3rd. The fully-instrumental album features his band THE CREATURES, comprised of bassist Ian Ross and drummer Rodger Carter. The album features experimentation with various genres - including western swing, Spanish flamenco, heavy metal and more - thoroughly showcasing John 5's diverse virtuosic abilities. Pre-orders will become available via iTunes very shortly. John 5 took a different approach with the release of Season Of The Witch, choosing to share his new music with fans throughout 2016 by releasing several tracks individually in the form of various music videos. Tracks/videos released include the fast-paced "Black Grass Plague", downtempo, introspective "Behind The Nut Love", hard rocking "Now Fear This", jazz fusion marathon "Here's To The Crazy Ones" (featuring a bit of "monkeying around"), heavy metal Claymation shredfest "Making Monsters", and last but not least, the whiskey-soaked "Hell Haw". The videos have garnered nearly a million views, collectively. "Since music is so visual nowadays, I thought these videos would be the best way to get my music out there, and it seems to have worked - now everybody knows the songs on the record," states John 5. "I put so much work into this record with the videos, the artwork, the songwriting and the playing - out of my catalog, this is by far my favourite solo record."